At first glance forest products markets look a little glum in Maine. A lot of the airtime on the news is directed at mill closures and declining markets. What the news doesn't always tell you are the new opportunities and investments that are being made in some of the more successful mills and other global marketing opportunities that are opening up. Regardless of the market conditions, it is always a good idea to keep different eggs in different baskets and not rely solely on a few markets. This also works for the species and quality of trees you maintain on our woodlot. 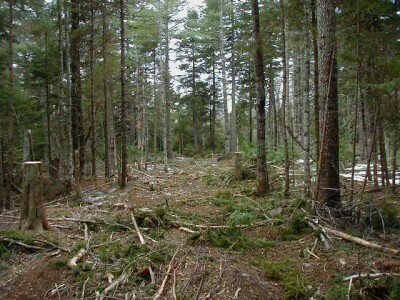 Managing your woodlot is much like managing your investment portfolio. The more you diversify your investments the less risk you assume. Trees of various species and conditions (mostly better quality) will give you more options in the future to take advantage of markets and capitalize on your investment. Not only does diversity in the structure and species of your woodlot improve your ability to take advantage of a variety of markets, but it also benefits other management goals such as creating habitat for a broader range of wildlife. Even aged management of your property (maintaining trees of mostly one age class) also decreases your diversity and lengthens the time between harvests and your income from those harvests. If you harvested the majority of your trees in one entry it could be 40-60 years before you could enter those stands again for treatment. Uneven or multi-aged management allows for 3 or more age classes to be grown at one time. With this management strategy a landowner could enter a woodlot every 15-20 years and take advantage of certain markets more often. Maintaining trees of varying sizes and ages allows you to selectively harvest ones that are mature while growing the next crop at the same time thus decreasing the time between entries. Of course not all woodlots are created equal and sometimes our options are limited. At times a mixture of both strategies should be applied depending on the conditions of a given stand of trees. Whichever strategy you choose for your property, take the time to decide what your long term goals are and plan carefully to maximize the full benefit of your property.